During the period from January 19 to February 28 in 2019, we will be operating an "Ice Hotel" where guests can have a below freezing accommodation experience. 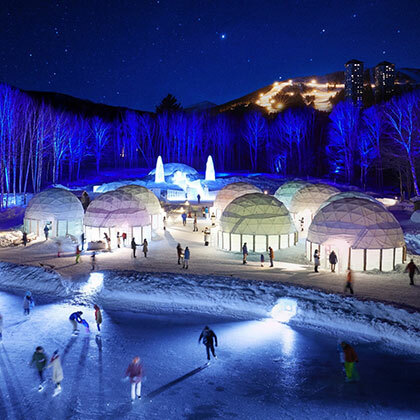 This Hotel consists of a dome-shaped space setup within the "Ice Village", with all its ceilings, walls, and furniture made with ice. 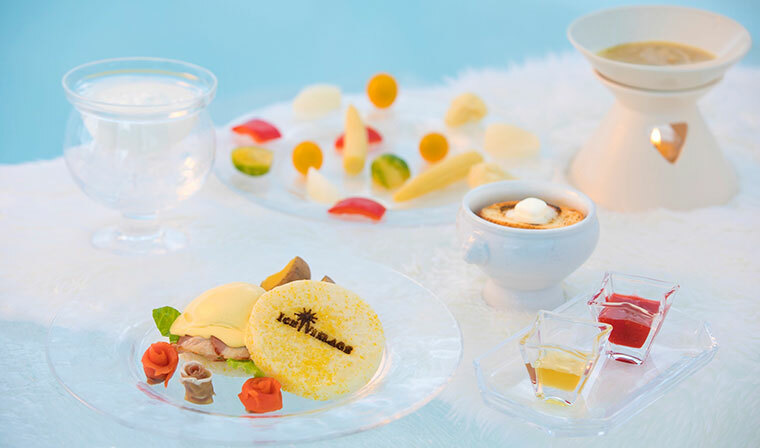 Along with the "Outdoor Ice Bath" experience and the relaxing "After-Bath Ice Lounge", is this year's newly introduced breakfast provided with "Hot Onion Gratin Soup on Flame". So that you may enjoy the icy space to the fullest from the night of check-in until the next morning. At Shimukappu-mura where Tomamu is situated, the temperature can drop down to 30⁰C below freezing during January - February. This is one of our special accommodation experiences which utilizes the freezing environment where even the ice does not melt. As the ice dome of 8.5m in diameter and 3.5m in height is designed in a special way (*1), it has seamless ceilings and walls. Also, you will be wrapped in a sleeping bag that endures extreme cold, so you may enjoy a good night sleep. (*1) Ice Hotel design technique: On a day with temperature under 14⁰C below freezing, a big sheet is blown up into a dome shape and water is being continuously poured over it for 3 nights. When the ice wall has reached a thickness of over 15cm, the sheet is taken out from the inside, and the ice dome is completed. 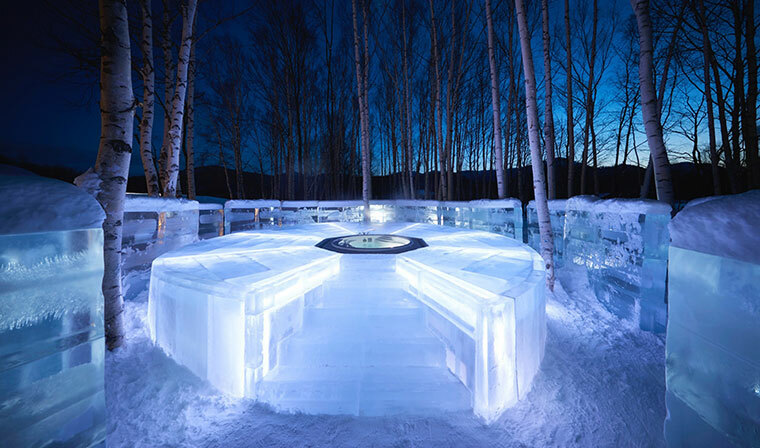 This is an outdoor bath surrounded by ice, with a panoramic view of the white birch forest. A bathing experience of being embraced by the silence of the winter forest and shimmering ice, while getting warmed up in the bath tub, is something you have never encountered before. * A warm changing area is available near the outdoor bath. * The bathing experience is only available to guests using the ice accommodation. * No shower is available. After-Bath Ice Lounge is where you will put on a special loungewear and relax with a drink, while the body is all warmed up after the outdoor bath. A space to enjoy the after-bath time. 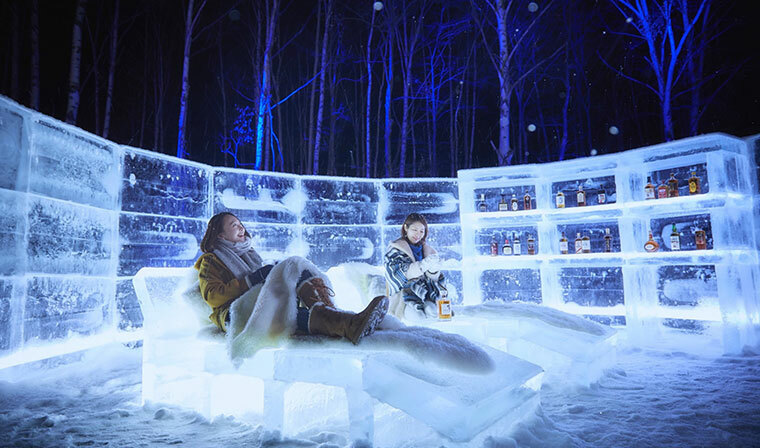 There are 2 relaxing lounge chairs and a drinks cellar made with ice, for you to spend a leisure time here. We wish you a special memory under the starry sky with pure fresh air, while sitting back on the relaxing ice lounge chairs. Relaxing with a hot drink under the winter sky. The Ice Cellar filled with whisky last year, is now filled with different kinds of ingredients and drinks like ginger, honey, lemon, cinnamon, milk, and whisky. So you may use them to create your own preferred flavor. Also, there is a total of 50 recipe cards for your reference. This is our new proposed way of spending the after-bath time at the After-Bath Ice Lounge while enjoying your drink. 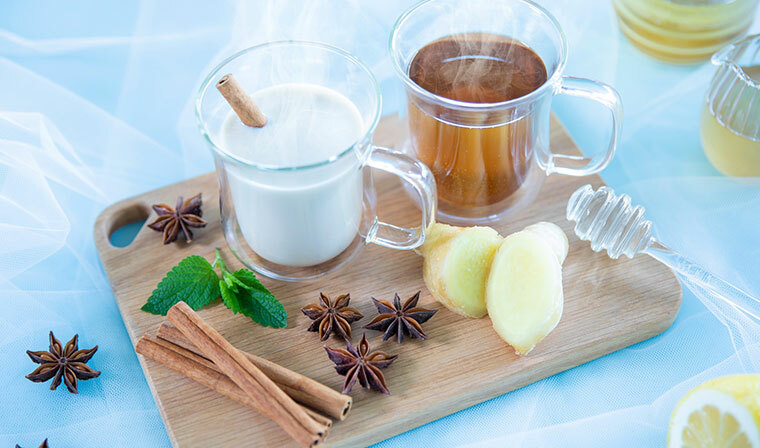 An example of hot drink. With the newly introduced breakfast, may you make the most out of the icy space through the next morning. This year starts a breakfast service exclusively for the Ice Hotel guests, where heart-warming soup and bagna cauda are provided. The soup is characterized by its cooking performance on flame by the Ice Village service staff in front of the guests, to serve it in a steaming hot condition. May you experience the pervading warmth in your body while having the steaming soup in the below freezing environment. Besides, the eggs benedict utilizing salmon and parma ham's saltiness, together with the bagna cauda with selected root vegetables such as carrot and turnip, are also provided. By adding the breakfast service, we aim to bring your enjoyment of staying at the icy world to the next level. 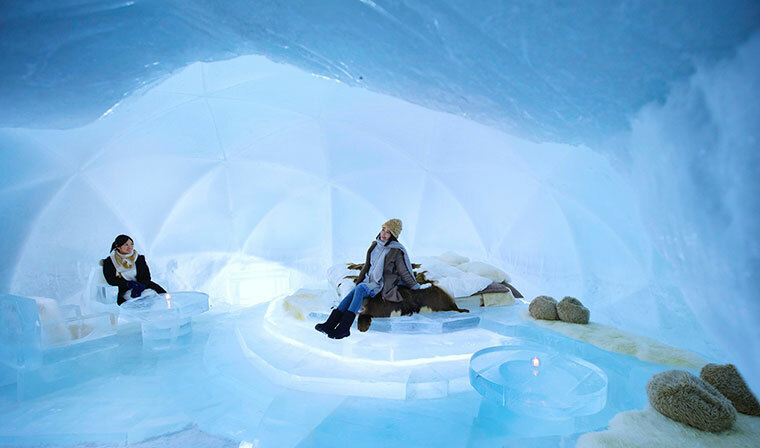 Included in the fee: 1 night stay at the Ice Hotel, breakfast (provided at "Ice Books&Café"), Outdoor Ice Bath, After-Bath Ice Lounge, hot drinks, sleeping bags, pajamas. * According to stocking conditions, the food content may vary. Guests staying at The Tower or Risonare Tomamu. *Above elementary school age. Reservation starts from September 19, 2018. Available to both hotel guests and day trip visitors.